If a game critic yells in the woods, does anyone hear her? This is one of the many questions that I left Critical Proximity (the first annual game criticism convention) with, a yellow light that has certainly slowed me down as a critic. These questions orbit around the ontology (here, describing the nature of the relationships that exist among critics, their work, and several communities at large) of criticism in general, but gaming criticism in particular. All this post is meant to manifest is more curiosity and a map for some thoughts on game criticism. I won’t even attempt to start unfolding the larger complications at play here, which are beyond my command and enough to write a book on. I do, however, want to add my own wrinkles to the conversation about game criticism’s purpose and significance. No one knows what game criticism is, or game criticism as it’s known to those familiar with Ian Bogost, Leigh Alexander, Cameron Kunzelman, Mattie Brice. To the gaming community at large those names mean a little more than my name does to them. 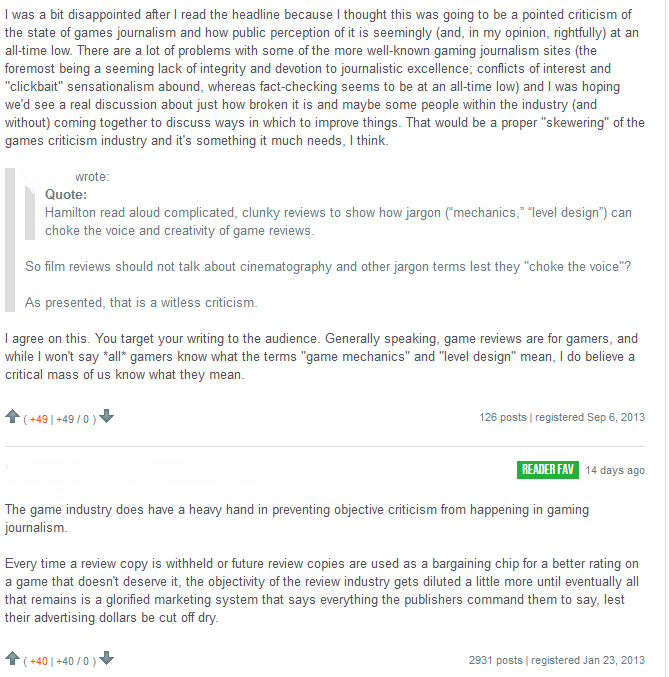 And this is sad, frustrating, and another point of pessimism against my hopes for game criticism. Game criticism, as is popularly conceived, has been relegated to product reviews, content marketing (previews), and non-news reporting. When you ask the average game player about game criticism they reply with IGN, not Critical Distance. The following is a screenshot from the comments section in the now “controversial” (cuz the reporter apparently didn’t “get it”) coverage on the Critical Proximity event. Here,voices that can be argued to essentially represent the mainstream gaming community’s ideas on what game criticism is appear. Although a small and unscientific sample, I’m sure you’ll find similar responses if you ask outside the game criticism nest. As an amateur literary critic, I’ve experienced this my whole collegiate career. You tell people you write literary/film criticism and they think you write book and film reviews. This shakes you after spending so much time in the Ivory Tower, forgetting that no one back on the terra firma has ever heard of Fredric Jameson or André Bazin. 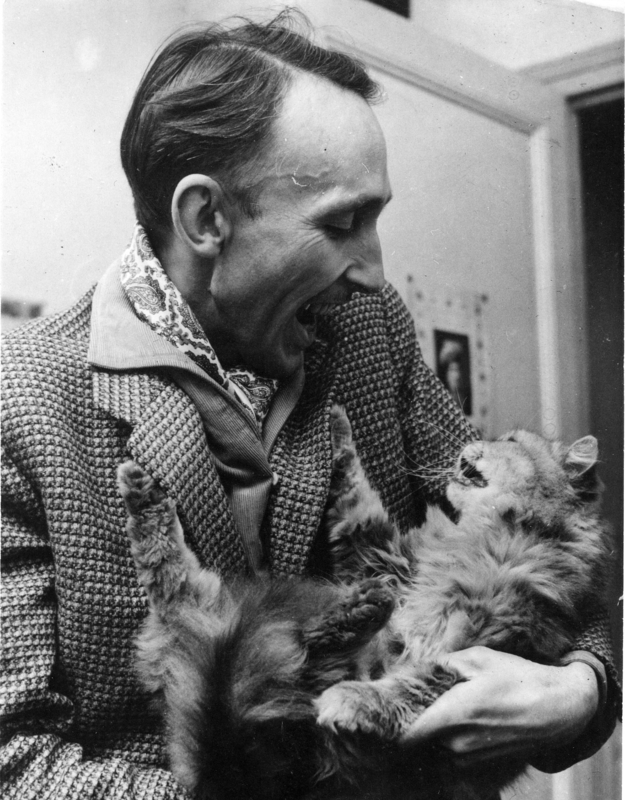 Yes, this is the legendary Bazin discussing mis-en-scene with a cat. No, you don’t have to know who he is to enjoy this. Attempting to define game criticism will certainly produce some straw man that’s besides the questions at hand, but a general understanding and description does seem absent from the popular discourse. It seems most appropriate to first approach this field of study using a negative theology, describing what it is not. Game criticism is not 10/10 reviews. It’s not whether you should buy a product. It’s not an exclusive preview. Game criticism is an attempt at understanding, interpretation, reflection, aesthetic and cultural evaluation, philosophy, social criticism, etc. Game criticism is a conversation, a more important one, about games. And there’s a lot of miscommunication. Many “gamers” who do happen to listen or more like happen to hear, charge the critic with “reading too much into it” in the comments and then go back to r/gaming. This typical response is partially due to inaccessibility, but also an inherent exclusionary force push that “serious” game criticism rarely acknowledges. In many ways, the mainstream conversation surrounding games parallels the discursive parameters for sports journalism. So much so, that sometimes I wonder if Roger Ebert was right. No politics allowed, no bias (meaning having an opinion that goes against objectivity the default bias), no philosophy or “reading into things,” no mention of anything socially controversial or significant. The interchange among critics producing “serious” game criticism or new games journalism is anything but. Whether it’s Cameron Kunzelman casually slipping into Foucault or Leigh Alexander bringing up the fact that AAA gaming culture serves a predominantly young straight white male audience (the comments sections of which usually lead me further down cynicism road), gaming criticism is perceived as overly academic or taken as personal attacks. These discussions need to be had, but no one seems to be listening to each other. These “conversations” start off as firefights, move into critical standstills, then fizzle away like so many particle effects in the virtual night. No one’s opinions are ever changed, just reaffirmed. Of course, some do not care to speak to that audience that isn’t listening, opting for the insularly ecology that mimics academia’s exclusionary circle jerk. Of course, this can be a good and necessary thing, but experts only talking to experts seems a methodology more suited for the sciences than cultural inquiry. Mattie Brice said that “game criticism is a radical act.” And while Plato’s gadfly needs to live, annoying and arousing the cattle, I wonder if there’s another way to get through, another way to speak. Because yelling doesn’t seem to be working on any sides. I don’t have the answer, only more questions. People a lot smarter than me are dealing with what boils down to making criticism in general relevant (a struggle signified by the game critics’ need for Patreon) to the masses and haven’t provided a remedy. Maybe this is an oxymoron. Attempts at making game criticism relevant or significant seem to take the form of social justice, political agenda. This is fine. This is good. The “objectivity” and “non-bias” and contempt to any mention of sexism or racism (oddly enough, often by those who have never experienced either) are all inlayed with politics as well. Remember the fish forgets that he’s in water. Opposition is necessary. But this has left games criticism almost entirely concerned with representation, which is only 50% of a game. When this is the only way games are discussed, I wonder why game critics are game critics at all. If you’re only concerned with how something is presented, how it looks, maybe you should be writing about film or television, mediums that deal 90% in representation, and are still often problematic. Otherwise, game criticism becomes only a means to end, no longer valuable in itself or about the games themselves. Games criticism as an agent of change? I at most times doubt this, then I think on how it’s affected my own thinking. After discovering Critical Distance and the writers that I have mentioned, here, less than year ago, I’m certainly much more sensitive (not perfect) to others, attuned to issues of representation, willing to try to consider another perspective, and even more open to being wrong. Equally as important, game criticism (really thinking about it) has taught me to listen more intently. My concern is that this is to be expected. I am a regular. I came to the community ideologically weighted in that direction. My concern is how do we get the gaming community at large in the conversation? Is this even possible? How can you speak to someone who isn’t listening and doesn’t want to? As it stands, if a game critic yells in the woods, she simply arouses the echo of familiar voices throughout a forest preserve. You can read and watch the wonderful and thought provoking talks from Critical Proximity here. I would also encourage anyone who happens to be reading and isn’t familiar with some of the writers I’ve mentioned to check out their work. In providing new ways to look at games, these critics also provide new ways to enjoy them.